Whether you’ve just purchased Office 365 or have been using it for a while, deploying and managing safe access to Office 365 is not simple, fast, or pleasant. It’s your job to get the most value from your application investments, and while Microsoft has tools to assist like ADFS and DirSync, they are not only cumbersome and costly to maintain, but do not meet industry standards that can be scaled across your organization. And let’s face it, you’re not just implementing Microsoft products. Can you extend ADFS beyond Office 365 in a timely matter? 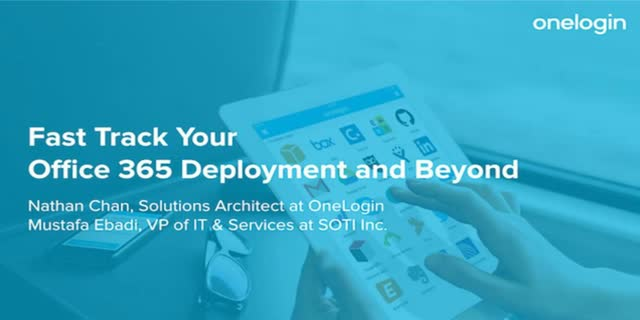 Join OneLogin and customer SOTI, a proven product innovator and EMM Industry leader in mobile consulting, for an informative webinar about deployment best practices for Office 365 integrated with Active Directory.